Howdy folks. Emily here with another Finally Friday card. Sorry for being a tad late posting this. It's been a hectic week in here in NE PA. Today I have another card for you using a Kathy Cyr image. I love this cute Christmas Morning image. Her and her feline companion look like they are ready to dig into those presents. She is such a fun image to work with. You can find her in the QKD Store. I printed off the image on Neenah White card stock and colored the image with colored pencils and OMS. I used some Sakura Glitter Gel Pens for the presents and the decorations on the tree. I picked some DPs from my stash from a couple Christmases ago. The sentiment is one I have had in my stash since I first started making cards. The image, DP, and sentiment are matted onto a nice Christmas Green and the whole thing is on an Old Olive card base. Thanks for stopping in today to see what we have created using the wonderful images from QKD. Have a wonderful day. 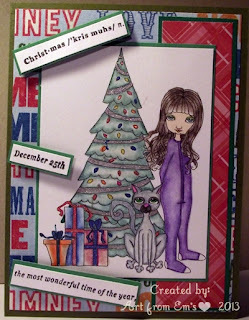 Great coloring on Kathy's image, and a cute card with which to frame it!! Nice! !